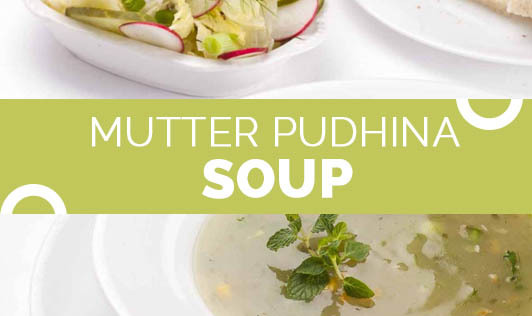 This wholesome soup is an apt choice to satisfy your midevening hunger pang. 1. Heat a non stick pan; add 1 tsp butter, chopped onions and sauté till the onions are soft and translucent. 2. Add 2 cups of green peas, 1 ½ cups of water, salt and boil them together till the peas are cooked. 4. Blendrize the cooled peas in a mixer to make a smooth puree. 5. In a broad non stick pan, mix 1/2 cup of water with corn flour milk paste. Now add the prepared purée, mix well and cook on a medium flame for few minutes while stirring occasionally. 6. When the soup becomes slightly thick, add the pepper powder, mint leaves and cook on a medium flame for 1 to 2 minutes. • You can use 1 Tablespoon of skim milk powder to make the soup taste creamier. • Replace butter with olive oil to improve the quality of fat.